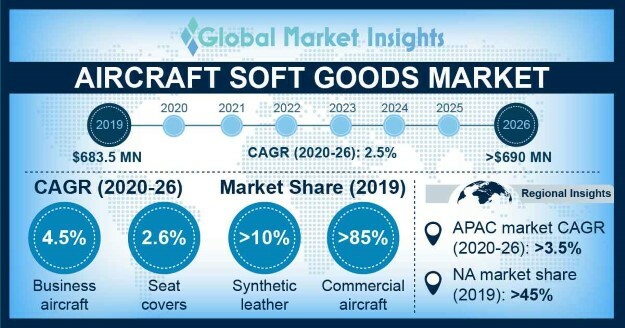 Aircraft Soft Goods Market size is estimated to surpass USD 560 million by 2024; according to a new research report by Global Market Insights, Inc.
Increasing number of air passengers leading to growth in international and domestic fleet have enhanced upholstery product usage such as carpets, seat covers, and curtains. The global airplane delivery increased from 1,714 in 2016 to 1,740 in 2017 to cover the production backlog. This continuous production will fuel aircraft soft goods market during the forecast period. Seat cover will witness around 3.5% CAGR till 2024 owing to increasing trends toward upgrading seat and support covers in commercial airplanes. In addition, proliferating demand for admirable cabin interiors in executive class installed with superior carpets will support aircraft soft good market size over the forecast timeframe. Carpets have a substantial share owing to the availability of enhanced cabin space and rising airplane fabrication to meet the backlog. Curtains will foresee a considerable growth with the utilization for cabin separation in commercial airplanes and business jets. Refurbishment of old airplanes with focus on upgrading business and economy class cabins ensuring the safety of passengers and improving cabin interiors, will enhance the product demand. Adoption of new materials including blended fabric and replacement of leather with synthetic products offering improved surface texture and reduced cost and weight will boost aircraft soft goods market from 2018 to 2024. Commercial aircrafts will contribute over 85% of the overall revenue share in 2017. The growth can be credited to the expansion of overall aerospace industry and rising comfort level demand from passengers. Regional jets segment will witness a healthy CAGR of over 6.5% from 2018 to 2024 owing to increasing regional flight frequency and utilization of lightweight upholstery products in these airplanes. Nylon/wool blend fabric will contribute over 70% of the overall material-based aircraft soft goods market share by 2024. This can be attributed to better material properties such as higher durability, water & wrinkle resistance, and insulation. Nylon fabrics can be blended with other materials including polyester to further enhance the comfort and material elasticity. Synthetic leather materials are growing at a fast pace owing to low cost and less wear compared to natural leather owing to resistance to breathing. Tear and puncture resistance properties in natural leather will enhance the industry growth in the next seven years. Further, polyester fabrics will witness a healthy growth with durability and chemical resistance properties which in turn boost aircraft soft goods market share from 2018 to 2024. OEMs will exhibit over 3% CAGR till 2024 owing to product installation after the airplane assembly. The escalation in industry can be attributed to long-term contracts between companies, ensuring an unremitting product supply. Aftermarket segment will witness a robust growth with a rise in refurbishment activities and replacement of worn-out goods with advanced ones. North America aircraft soft goods market has a major share and is projected to cross USD 300 million till 2024 with the presence of well-established airplane manufacturers including Boeing and Bombardier. Asia Pacific will witness significant gains with growth in the commercial aerospace sector and increase in overhaul activities in worn-out airplanes. Europe industry share will foresee a substantial growth owing to the increase in passenger traffic. Major players of aircraft soft goods market include Anker Company, Tapis Corporation, Spectra Interior Products, RAMM Aerospace, Mohawk Group, Lantal Textile AG, InTech Aerospace, Hong Kong Aircraft Engg. Ltd. (HAECO), F-list, Fellfab, E-Leather, Desso Group, Botany Weaving Mills, Aircraft Interior Sol., Aircraft Interior Products, Aero Foams, and Aero Floor. Companies are increasing their product landscape to boost aircraft soft goods market share. For instance, in March 2018, Lantal Textile AG launched TEC leather with excellent thermal property and unique level of cleanability.